De Pere Youth Hockey is proud to offer programs for youth skaters ages 4 - 18. De Pere Youth Hockey Association serves the school districts of East De Pere, West De Pere, Denmark, and the surrounding communities. Started in 1972, our program aims to develop the skills, sportsmanship and leadership that allows players to reach their full potential. Link to De Pere Voyageur High School Hockey to find game schedules and events of our varsity and junior varsity teams. Do you need to make an online payment? Please click on the image to the right to make an online payment to De Pere Youth Hockey. Bukac Training by JP Coppo – DePere Voyageurs, Coach Coppo has been using the Bukac method of training for the past 6 years in our area. Using section hockey specific training, and game like situations along with Power Skating and individual skill training. This is a great off season training method that develops youth, high school and adult players at a excelled rate. Bap’s Hockey – Former St. Norbert player and student, now professional hockey player, Mason Baptista has been in the Green Bay community developing individual hockey players for the past 4 years. Being a student of the game, Mason has trained some of the best local and nationwide talent in recent years. The weekly sessions will be on Mondays and Tuesdays (All at Cornerstone Community Center). Teams, Times, and Dates are below. Price per skater is $300.00. Price per Goalie is $35.00, and gives you all sessions. Spring Hockey starts 3/18! 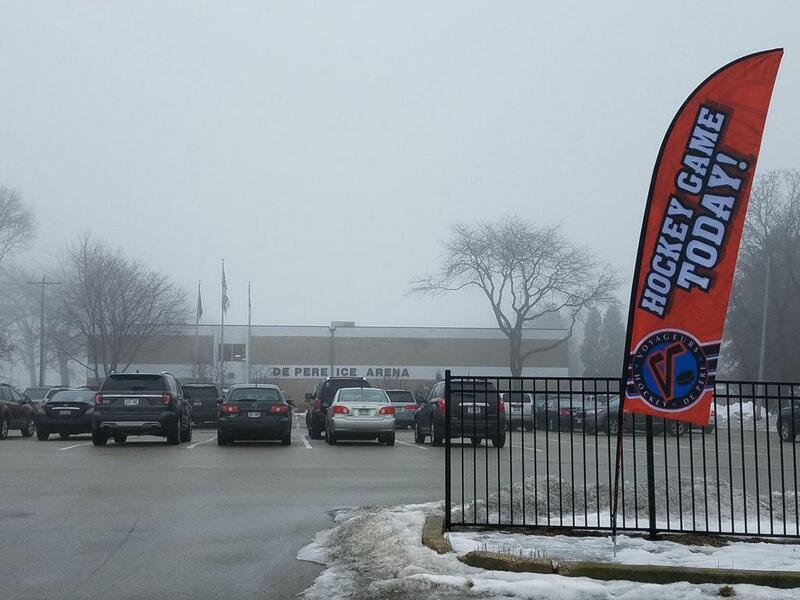 All practices/scrimmages/games are held at the De Pere Ice Arena. An email has been sent out with details and teams. Below are the times for each session and a PDF with the teams. There are two teams for each level and they are assigned as White or Blue. This is the jersey color, it does not have anything to do with skill level. Teams were chosen based on spreading the current skill level evenly between both groups. Once it gets underway, coaches may move kids around so that the teams stay relatively even. Spring Hockey runs from March 18 - April 24. The calendar is updated and you will be able to load the teams into your electronic calendar. Camps and Clinic notifications are rolling in! Keep checking back for more hockey opportunities after regular season ends. BWW donates 10% of your bill to DPYH! Additional volunteer opportunities are listed on the Dibs page. Wouldn't it be great to get instant updates on your phone with changes to game times or practice times? Steps to link your team’s calendar(s) to your e-mail account are noted on the Calendar page. Support us when you shop on Amazon at smile.amazon.com/ch/39-1462028 and Amazon donates to De Pere Youth Hockey Incorporated. You can now buy & sell hockey equipment through our site on Facebook! Just like any other Marketplace page, you can browse, post and comment. Click HERE to get to the page and "like" it so it shows up in your feed. Sign up using Promo Code 373c-2481 to watch games and practices Live & On Demand, share clips on social media/email and submit highlights to be considered for Plays of the Week. LiveBarn offers a free trial, and you can cancel at any time. ©2019 De Pere Youth Hockey / SportsEngine. All Rights Reserved.